A corps member who won the North Face’s $25,000 award for her organization. According to a recent blog from Secretary Sally Jewell of the U.S. Department of the Interior, North Face has donated $100,000 to the Department of the Interior to award four grants to the Department’s service corps, which provides jobs and service opportunities to young adults and veterans. The donation, which supports the company’s “Never Stop” PR campaign, follows North Face’s quarter-million dollar donation last year for the corps. 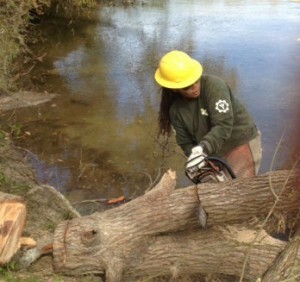 The corps is a group of organizations that employs Millennials and veterans to repair public lands infrastructure and perform other tasks in natural federal areas. Outstanding members of four of those organizations were selected by the North Face, and their organizations received the prize while the winners were recognized both by the “Never Stop” award itself and a shout-out from Secretary Jewell. The Department of the Interior—which runs nine bureaus overseeing fossil fuel extraction, National Parks, and Native American relations—has been seriously underfunded in past years. One way Sally found to circumvent this issue is public-private partnerships, which involve firms from all industries (North Face and American Express, for instance), to fill funding gaps and build new programs. The public-private partnerships here are vital to fill fiscal gaps, but the issue poses ethical issues with corruption: if the Department of the Interior relies on AmEx or North Face to fund a major program, does that not create a debt-based relationship between the government and the corporation? Whereas government money makes Interior accountable to the people, corporate money makes Interior accountable to the corporation. It is important for AmEx and North Face—and any firm involved in these deals—to approach the funding as a philanthropy project instead of building a relationship to exploit it. All that aside, this connection is a powerful example of enlightened self-interest: North Face’s industry depends heavily on public lands and future generations’ engagement in the outdoors, and these grants help with the firm’s PR while building toward both those goals.